After a long, dry summer, a rainstorm is often welcomed. The first rain of the season always seems special, and a bit different, especially because they are often accompanied by a unique smell. You’ve probably smelled this type of rain before. It has an earthy and sharp, sweet smell that is unlike any other. And it doesn’t happen with the rainy days that follow. The smell is distinctive enough to have its own name, petrichor, pronounced, peˌtrīkr. 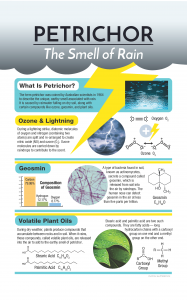 The February issue of ChemMatters magazine has a wonderful infographic about petrichor that was developed by an ACS ChemClub member. This term was coined bin 1964 by two Australian researchers, Isabel Joy Bear and Richard G. Thomas, for an article in the journal Nature. The term comes from the Greek word petra meaning stone, and ichor from Greek mythology, meaning the fluid that flows in the veins of the gods. It may seem odd that rain would have a smell at all, because rain starts out as pure water, which has no smell. Bear and Thomas reasoned the smell must have something to do with what happens as the raindrops hit the ground. They duplicated this process in their lab by drying samples of clay earth and then subjecting it to varying amounts of moisture. By analyzing the compounds that cause the odor, researchers have identified the source of petrichor. It turns out that during dry weather, soils collect volatile plant oils (such as terpenes and fatty acids) that are released into the air when the rain lands on them. Another contributor is the compound named geosmin, which is formed by bacteria in the soil. The human nose is very sensitive to geosmin and can detect it in as little as five parts per million (ppm). And finally, ozone (O3) and nitric oxide (NO) that occur naturally in the air contribute to the smell of rain, as they are absorbed by the rain as it falls. It is interesting that in India the perfume industry in the region of Kannauj hasbeen making a perfume by distilling these same elements from the clay soils in the area. it is known asmitti attar orEarths perfume. It has the same smell as petrichor. While the chemical nature of petrichor has been well understood for several decades, it wasn’t until 2015 that scientists understood the mechanism of how the odor was released into the air. Researchers from the Massachusetts Institute of Technology (MIT) used high speed cameras to film raindrops hitting the ground. They found that when the raindrops hit the ground they form create aerosols in air bubbles inside the drop, like gases in a glass of soda pop. These bubbles burst and escape into the air, making Earth’s own perfume. This graphic is a winning entry in the inaugural ChemClubInfographic Contest. ACS ChemClubs were challenged to take a chemistry topic and turn it into an original informational graphic. Entries were judged on originality, and the ability to convey accurate science details clearly and creatively. This infographic was conceived by Michelle Prunier from Guilderland High School in Guilderland Center, NY. It appears in the February 2017 issue of ChemMatters.